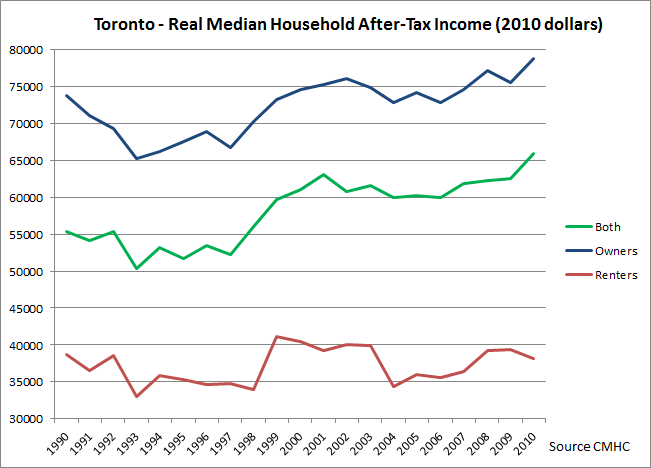 Update: Toronto median household income for 2012 is $73,300 according to demographia (pdf). Below is the data from demographia. 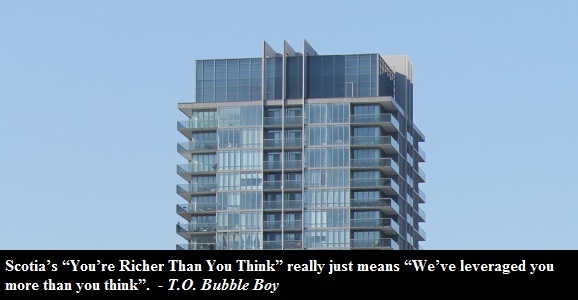 Note, that CMHC and Demographia have different values. 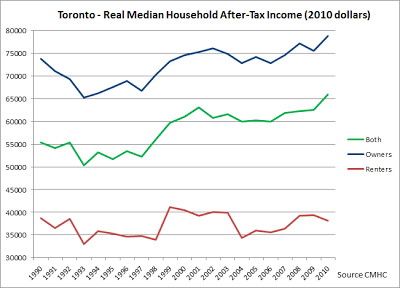 Update 2: Time series data for average and median incomes in Toronto 1975-2013 see here. Income growth between 1990 and 2010 was 18.95%. Between 2000 and 2010 8.03%. So far this doesn't look too bad, but let's zoom in a little bit and see how specific households did - those that own property and those that rent. Income growth between 1990 and 2010 was 6.78%. Between 2000 and 2010 5.63%. Finally, let's take a look at renters who did the worst. Income growth between 1990 and 2010 was -1.29%. Between 2000 and 2010 -5.68%. Yep, according to this data, renters now make less money than they did 20 years ago. Scary isn't it? By now you should probably be wondering how come the incomes for all households went up by almost 19% in 20 years, while owners income increased only by 7% and renter households had a negative growth. I don't really know the answer to that question as I am not a statistician. This is one of the reasons I thought the data might be wrong. However, if I were to speculate, it might have something to do with the fact that now more people own a place than 20 years ago. Below, is the plot of Toronto real median household after tax income. 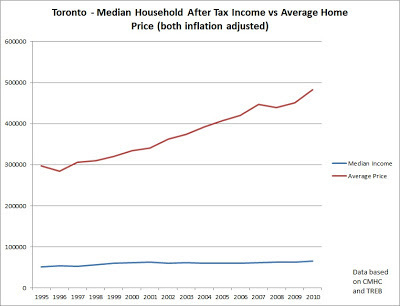 You might be curious to see how median incomes looks versus home prices in Toronto, so below is one such chart. Though be warned that the below chart is not the most accurate for few reasons. 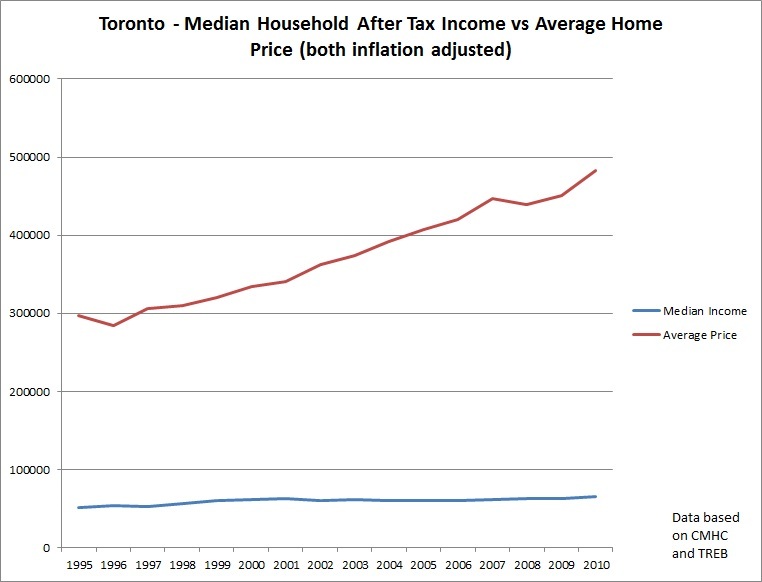 First the income data is for Toronto CMA, while the average home prices are for the City of Toronto. Both however are adjusted for inflation. Median incomes are in 2010 dollars and prices are in 2012 dollars. So expect some error there. Nevertheless, I made this graph just to show you the actual trend.